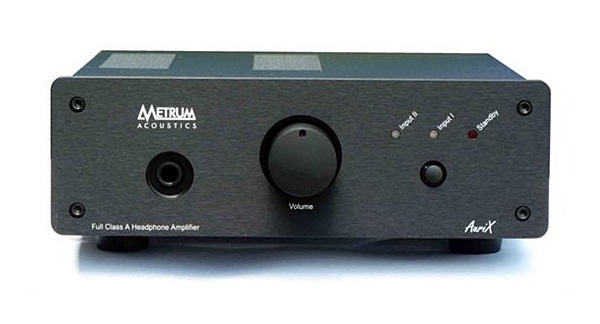 Our Andy concludes his Metrum epic with a headphone amp that makes music really sound like music, and makes you anticipate every note of much-loved discs. In short, he’s smitten. WELCOME TO THE third installment of my Metrum Acoustics trilogy (the first two are here and here.) I’ve had two superb DACs along with this fine headphone amplifier in my home now for probably much longer than I have any right to – with apologies to importer Ian of Critical Sound Information – so it’s nice, if a little sad, to be finally finishing off this little series. Up until now I’ve had little experience with head amps other than my little Cmoy portable mint-tin DIY job and my Fii0 E10 DAC/amp so I do understand if you take my 5 star rating with a grain of salt, but know this: I am genuinely moved by the performance of the Aurix. Good sound is good sound, no matter how much gear you’ve listened to. Created as a match for the Octave ‘Mini’ DAC, the Aurix is unmistakably a Metrum product with its simple yet elegant styling and solid build. The Aurix is the same size as the Octave at around 185 x 245 x 70mm (w x d x h) and together they’ll slot in almost anywhere. It has two RCA line inputs and one pre-output, a quarter inch headphone jack and a buffered volume control. It also features a toggle switch for gain adjustment up to 10dB should you or your headphone(s) need it. For headphones it outputs a maximum 6 volts RMS to a 600 ohm load and 2 volts to a 33 ohm load. But it is inside that things are a bit more interesting, or at the very least slightly less than ordinary. 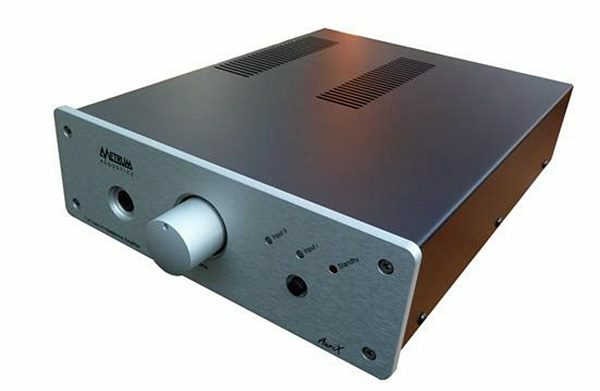 The Aurix is a zero feedback full Class A amplifier and uses a step-up transformer rather than valves or transistors. Two FETs are used as impedance converters, one driving the step-up transformer and one the headphones themselves and there is very little else, if anything, in the signal path. Running circuits in class A generates a lot of heat so two large heat sinks are used to alleviate this and they do prove to be very effective as the unit doesn’t get too hot at all, even when running all day. All of this provides, according to designer Cees Ruijtenberg, a high bandwidth and a very transparent sound with low noise and distortion. When I pressed for a little more info on the design principle, the reply basically boiled down to while the design itself is of course important, it is the sound that counts most. I think I really like this man. From what I can gather, Mr Ruijtenberg used a wide range of headphones to test the Aurix and it has been designed to perform well, particularly with high quality headphones. A large portion of the design – 60 percent of the circuit board in fact – is specifically for protecting your precious headphone diaphragms against subsonic effects (something we vinyl enthusiasts are certainly aware of), DC fluctuations and start-up pops. On this Mr Ruijtenberg says, in his opinion it is “unacceptable” that “most headphone amplifiers have very limited or no protection circuits”. For this review I used Sennheiser HD800, HD205 and Beyerdynamic T1 headphones. The T1s are rated a nominal 600 ohms impedance while the HD800s are rated at 300 ohms and the HD205s 32 ohms. Impedance is probably something worth taking into account when matching headphones to an amplifier but I think in general most types should work fine with the Aurix. Source-wise I used the Metrum Acoustics Hex and Octave DACs and my MHDT Labs Stockholm DAC with the marvelous JRiver Media Server running off my laptop. After allowing everything to warm up nicely, I settled into a quiet corner of the room for some intimate listening time. My initial impression was that the sound seemed too clean, too laid back even, but after an extended period of adjustment and experimentation (my ears and brain were perhaps too accustomed to the big, room-filling sound and acoustics of large speakers and powerful amps) the petite Aurix revealed itself to be a talented piece of equipment. The sound is in fact very clean, but rather than taking anything away from the excitement of a piece of music it makes for unfatiguing listening. Depending on the source there is virtually no noise floor – the Hex and Octave DACs, for example, seemed slightly quieter than the Stockholm in that regard, which brings me to a very important point. During my extended time with the Aurix I found it to be not only extremely transparent but also quite neutral and what this means in my view is that headphone preference is going to be critical, and if you have a range of different ‘phones then experimenting with their respective “flavours” is going to be much more enjoyable. Even more importantly, the source itself is going to have the biggest impact on the overall sound so whether you prefer a warmer, brighter, more neutral sound, it is going to depend on the sonic signature of your CD player, DAC or analogue set up. Holy Sons are one of those bands who, though they should by rights be better known, one is secretly pleased to have all to one’s self, as it were. An on-going project of multi-instrumentalist Emil Amos, also currently drumming in doom band Om, Holy Sons is gloomy, experimental, and genre-defying; folky hints of Bonnie ‘Prince’ Billy and David Pajo with guitar work that would make Jerry Garcia and Neil Young proud, albeit in an un-showy, understated fashion. The recordings are relatively lo-fi and often very intimate and stoned-out, making for ideal headphone fodder. Playing the gorgeous psych gem ‘Spirits High’ from the album I Want To Live A Peaceful Life (a sentiment to which I wholeheartedly relate), my head was filled with sound from ear to ear and beyond and where images were spread far and wide, it was done sensibly and believably so. The music was easy to listen to, not because of any laid-back-ness but rather because it is all right there to be heard; clean and clear with everything well placed and tonally, rhythmically correct. Buzzing guitar amps, ascending solos and quickening tempos along with Amos’ edgy, morose and somewhat apathetic vocal style coming to the fore helped to create a most rewarding listening environment within the realms of my battered skull. The final track on the album, ‘Amen’ has quite a deep doom metal-esque bass line which can really liven up a room when played through decent speakers, but it did come across slightly reserved through headphones and the Aurix. I hadn’t expected, however, to have my head blown apart and the way the rest of the song came together in such an aesthetically pleasing manner meant I wasn’t particularly bothered. Next I moved on to the Bad Plus and the contemporary jazz trio’s 2003 album These Are The Vistas for something even more challenging. This entirely instrumental album with just drums, piano and up-right bass contains some brilliant original material along with some surprising and stunning covers. Their version of Nirvana’s ‘Smells Like Teen Spirit’ is quite something but it’s Blondie’s ‘Heart of Glass’ that takes my breath away every time. For anyone familiar with the original, the Bad Plus have, it seems, maniacally deconstructed the song in a free-jazz wig out with abrupt mood swings (much like myself, really) before faithfully restoring the melody for the finale. For the uninitiated it could be quite full-on but it is extremely and deliciously exciting. All that aural violence could potentially be something of a challenge for even the most easy-going headphone set up but it was taken on by the Aurix/Hex/Octave/T1 combo (the T1’s, incidentally, were my favourite headphones for listening with the Aurix) with a consistently truthful and engaging performance that was not one bit difficult to listen to. During the slower passages the music flowed with creamy fluidity; rhythmic and inviting. As the pace built up, the timbre and speed of the drums was breath taking, the strings of the bass stood out clear and the bassline rumbled low before pouncing like some creeping psychopath. The piano was simply exhilarating with pianist Ethan Iverson’s left hand seeming to have a life of its own, the percussive notes alighting, spraying outwards, flashing and trailing back down to earth like the most exuberant of fireworks displays. I also liked how I could easily put myself into the body of any one of the musicians as though I were myself involved in the performance – is this something only those of us who play an instrument ourselves would do or is it characteristic of all music and hi-fi enthusiasts? It’s undoubtedly easier to do with good head-fi than with a speaker-based system. You couldn’t make me enjoy The Eagles’ Greatest Hits even if you strapped a bucket of angry rats to my bum but I’ll listen to noise weirdo Nurse With Wound any day. The “music” of Nurse With Wound’s 1980 album Homoptomy For Marie is both disturbing and compelling, sinister but not without a certain beauty. Because it is more sounds and noises, tape manipulation and loops than conventional music, I think Homoptomy For Marie is a good test of the atmosphere and tension a system can present. There is no shortage of tension here because what you have is pure dark silence, an unsettlingly portentous emptiness then suddenly – as on the title track – a sharp strike of a gong which rings out into oblivion. Random gong hits then the voice of a little girl emerges from the gloom: “I didn’t know anybody and there was a funny smell”, or “When they want to see what your blood’s like…”, then an adult female: “Don’t be naïve, darling!” Disturbing creaking and other indeterminate sounds come and go like ghouls – like jazz it can be the space between notes or sounds which can create the tension and enjoyment (according to Lisa Simpson, anyway) and with Nurse With Wound there is often a lot of space. The Aurix kept me on edge, thrilled and disturbed and even though I am familiar with the album, my anticipation levels were kept high as I waited for the next creepy surprise. The Metrum set-up recreated the darkness and the sounds with almost too much accuracy – I dare you to listen to this very set up and this album at night, on your own and with the lights out. I’m still trembling. And for goodness sake, don’t let your children hear this…. Next up, I liked the way I could really feel drummer Lol Tolhurst keeping time to The Cure’s ‘10:15 Saturday Night’ from Three Imaginary Boys. Hearing the crack of his snare and smashing cymbals along with the simple but effective 4/4 guitar and bass lines was almost as thrilling and evocative as the first time I ever heard this song. At the fore, strikingly laid bare, was the unmistakeable voice of Robert Smith. I could hear all the inflections of his somewhat pleading, breathy and sighing vocal and despite the theme of loneliness and despair (that bass line sounds like the unrelenting onwards tick of a clock, doesn’t it?) it was actually rather invigorating. I found myself listening almost exclusively with the gain switched up to 10dB for what I perceived to be a fuller, richer sound. Even so, I occasionally thought there needed to be more oomph – more guts, if you will – but when I really gave it consideration I decided that this wasn’t necessarily the case. I was getting free-flowing, unblemished sound and I could listen critically without destroying my ear holes. I could hear plenty of detail, subtle or otherwise and layers and imaging to die for. With its well-measured speed, timing and rhythmic capability – for sure there may well be better performers, but scroll back up and remind yourself of the price here – the Aurix also has the all-important “boogie factor”, though granted, with that you will be limited by the length of your cable…. Until now, my own experience with headphones over the years have at times been nothing short of claustrophobic. Bloomy bass, dulled, muffled midrange and/or hissy, screechy treble has the potential to put one off headphones for life. Even good quality headphones need a decent amplifier – the Aurix is just the thing for the job and when combined with good headphones it’s the antithesis of claustrophobic. Thanks for the positive review. I should point out that I have the ‘Greatest Hits’ on vinyl – but never listen to it. The addition of Joe Walsh (a long term favourite) to the band however, makes their comeback concert worth owning. Goes without saying in DTS. Cees has suggested you might like to listen to Pavane but I said you will be very Metrummed out by now. Besides which, I also had to point out that if I did send one off, I probably wouldn’t see it again until late next year ! A good place to take your own phones and music, to listen to a very wide selection of gear. Plus a good range of headphones from all price sectors. HD800’s were in abundance last year. Also of use to main system listeners (me), although it might not seem that way. Quality phones let you hear right into a recording and it’s good for comparison with what’s coming out of your speakers at home. Levels of detail can get ‘filtered’ on their long journey through a main system, unless (I’ve read), you own an amp and speaker combo costing over $40K. You like your music loud, so I will test out the SPL’s generated (out of interest) on the volume clock. As you are an analogue man, naturally only an analogue meter will be used. Reviewer Jimmy Hughes commented a very long time ago, that every track on a CD has a volume limit. They will vary but things deteriorate beyond a certain point and I have found this to be true. Better recordings seem to be able to take more grunt. You’ve intrigued me with the spooky one – Pavane might be perfect for this and I can try it out on listeners at the show. There will be a crowd and good lighting (blindfold available – optional) to appease Health and Safety regulations. As a follow up to SPL’s through a pair of S800’s, 86dB peaks on some music at 12.15 on the volume dial with zero gain. This is around recommended reference listening level according to most. At 12 0’Clock with gain setting on, 82dB delivered with same music and at 12.15 – 96+ dB peaks.